Too bad I don’t have an intra-day chart of the Index activity during the day. That would tell us if the action was down-up-down or down-up-down-up. And the volume during each phase would be interesting as the daily volume improved somewhat. Although still relatively small it was still the highest volume day for the past 6 weeks. Another miserable indicator is the momentum indicator, today at its lowest level in almost a year and a half. 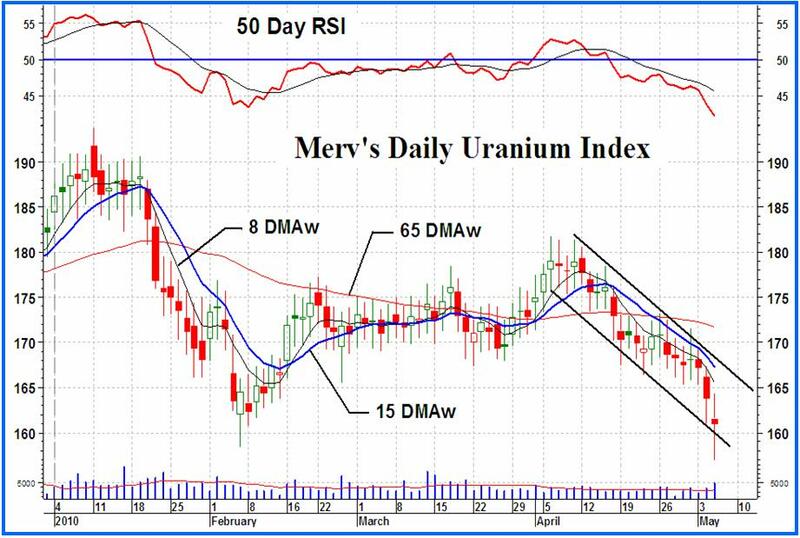 A more extensive analysis of the uranium market action will be forthcoming on the week-end. 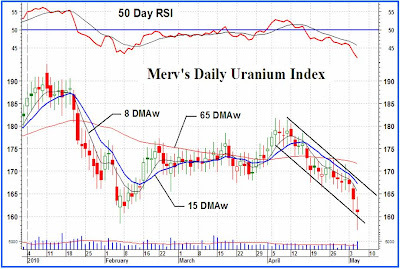 The Merv’s Daily Uranium Index closed lower by 2.82 points or 1.72%. There were 13 winners, 31 losers and 6 sitting the action out. As for the five largest stocks by market action, Cameco actually gained 0.3%, Extract also gained 0.2%, Paladin lost 2.8%, Uranium One lost 3.6% and USEC lost a whopping 16.7%. Must be something in the news that I haven’t yet looked at. The best winner of the day was JNR Resources with a gain of 6.1% while the loser of the day was that 16.7% loss by USEC. Market Vectors Nuclear Energy ETF lost 1.8%. Everything on the intermediate and short term is way on the negative side. 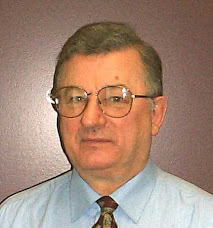 BEARISH remains the rating for both of these time periods. The Stochastic Oscillator is holding its own and not really plunging with the Index. It closed today still very slightly above its level from two weeks ago. This has some encouragement that we are getting close to some sort of reversal. If I keep mentioning a reversal just ahead long enough sooner or later I will be right. As a good analyst that will be the time I will remember the prediction. I will stick with the lateral as the direction of least resistance based primarily upon this SO strength.